Ericsson invited me to hang out with them in Stockholm for a couple of days so I did and here’s what I got up to. 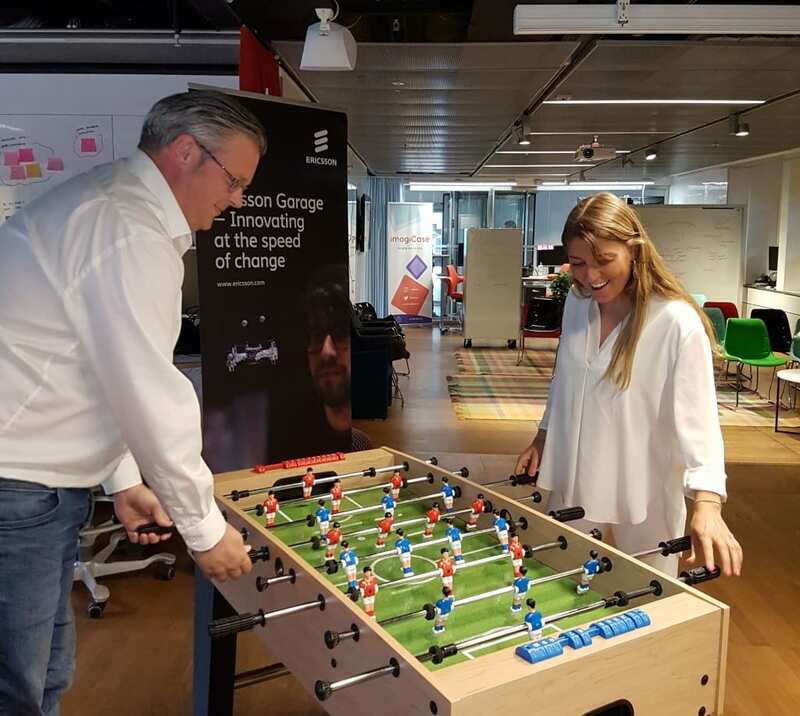 Towards the end of Ericsson’s Q1 quarterly earnings call, Head of Marketing Helena Norrman and I indulged in a spot of light banter, during which she reflected on how nice Stockholm is at that time of year. I responded that I haven’t been there for ages because Ericsson doesn’t seem to do press trips anymore, at which point Norrman called my bluff and invited me over. Before long the excellent Minako Nakatsuma Olofzon had sorted everything out and off I went. The last time I was in Stockholm was for an Ericsson analyst day and the trip was so brief I didn’t really get to see much of the place. This time I decided to stay for three nights so I wouldn’t be in a hurry. 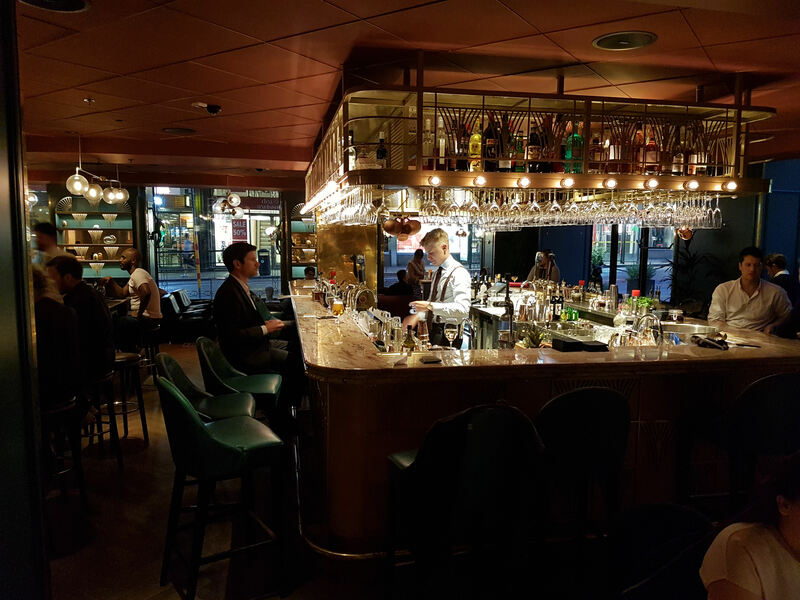 I can definitely recommend the Haymarket by Scandic, which is a converted art deco department store in the Norrmalm district, which seems to be where a lot of the cool kids hang out. If you don’t believe me, check out the bar (which isn’t cheap). My first meeting was with Helena, who have me the top line on Ericsson’s current situation, strategy, etc. The long and short of it is that Ericsson was spread too thin by the time the Hans Vestberg era came to an end. In its desperation to compensate for declining revenues in its core markets Ericsson had got carried away with diversification and entered into too many ill-advised deals. New CEO Börje Ekholm noted all this and decided the first thing that needed doing was some pretty serious pruning, in the form of disposing of some of Ericsson’s more peripheral and/or under-performing businesses and a headcount reduction of around 20%, including a fair few senior execs. The new streamlined company now focuses its efforts on four main silos: networks, managed services, digital services and emerging business (which seems to include ‘others’ like Red Bee). I wasn’t able to bring a video crew with me for this visit so I decided to record some video on my Samsung Galaxy S7 phone, using a selfie stick/tripod and some clip-on microphones. This was a bit of an experiment and to say it was an unconditional success would be a definite overstatement, but hopefully it added some value. Here’s me chatting to Helena – you will notice this was recorded just as the football World Cup was started, so you get to the benefit of hindsight from which to judge our expectations. We then went on a tour of the Ericsson Studio, which is a kind of permanent manifestation of Ericsson’s Mobile World Congress stand in so much as it features a bunch of demonstrations of Ericsson’s latest cleverness. My guide was Jon Gamble and my camera operator was Minako, so I’ll let this video clip, in which I get virtually knocked off my bike, speak for the Studio. Back to the meeting room and a chat with Peter Laurin, the head of the aforementioned managed services silo. I hadn’t realised how active Ericsson is in the field maintenance of networks; it apparently manages the field forces of most of the UK operators. But it has apparently been a bit too active, because this division has been losing money and part of the turnaround strategy has been to exit some ill-advised contracts. Here’s Peter to tell you more. My final interview of the day was with Håkan Andersson, Head of Technology Strategy, who took me through the current technological environment and what Ericsson’s strategy is for capitalising on it. As you would expect it’s all about the 5G and Andersson gave me a pretty deep dive, so before filming the clip below I had the temerity to muck about with his slide deck in order to distil it down to what I thought was the most interesting stuff. Thanks for putting up with my control freakery Håkan. In the evening I had the pleasure of hanging out with Helena, Minako and Head of Corporate Comms Peter Olofsson. 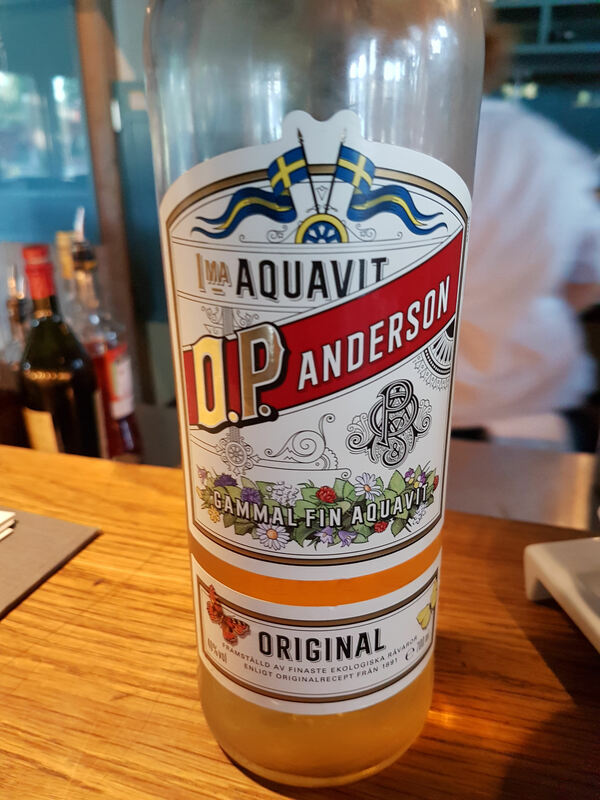 We jumped on a boat and went out to the first of a group of small islands known as the Archipelago, to have dinner in a restaurant with great views and an even better selection of aquavit called Fjäderholmarnas Krog & Magasin. 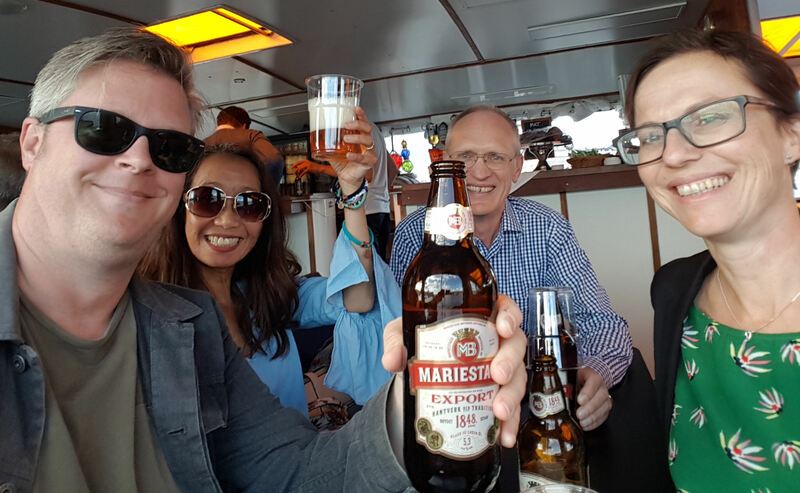 Here we are on said boat having a cheeky beer to get things going – I had to help Minako with hers – followed by a cool view of Gamla Stan (the old town) from our returning boat. The next day I met up with Peter Olofsson (who is also an expert tour guide) again to check out a really interesting exhibit that’s hidden away from the rest of the world in a back room of the police museum. 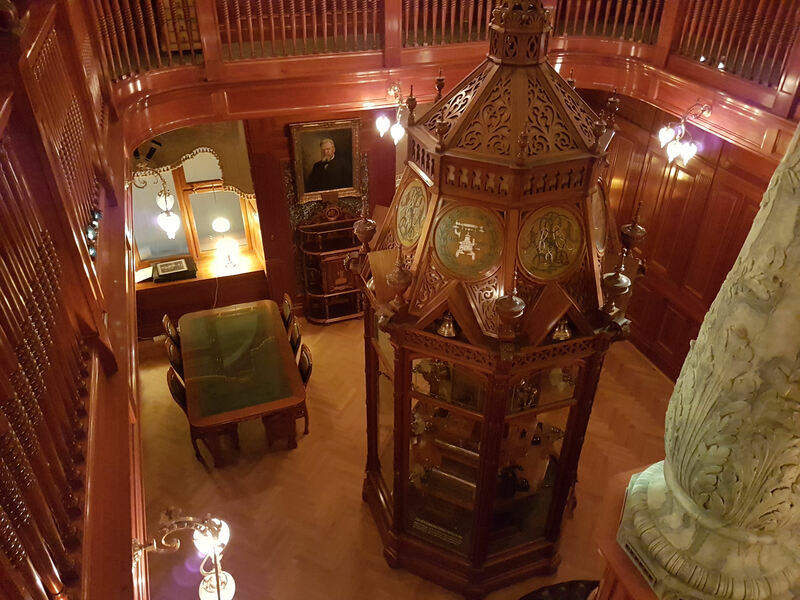 The company was created by Lars Magnus Ericsson back in 1878 to bring telephones to the Swedes and somehow they managed to preserve his original boardroom and transport it to darkest Östermalm, where now only people who know the secret Ericsson password get to see it. It’s like stepping into a time machine and a great reminder of the dizzying progress the telecoms industry has made over the past century or so. A cab ride back to Ericsson Towers in Kista led to a chat with Matilda George, who runs Ericsson Garage. While this isn’t another piece of ill-advised diversification it is symbolic of need to not stand still either. The Garage is essentially an in-house incubator where Matilda and her colleagues get a free rein to hang out with startups, support them and maybe even get involved for the long term. I was especially pleased to see the array of bean bags, primary colours and foosball tables that everyone knows are essential to fostering a startup environment. Following a spot of lunch in the impressively large and well-stocked Ericsson canteen I met with Mikael Halén, Director of Government and Industry Relations. I decided not to keep filming because I wasn’t sure how the experiment was going, so to summarize: Mikael filled me in on how companies like Ericsson interact with governments and regulators as trusted technology advisers. We walked through the pros and cons of the three main 5G spectrum bands, with 700 MHz being used mainly for coverage, mmWave for capacity and 3.5 GHz having a more general purpose role in dense environments. A big issue is spectrum harmonization, especially in the 3.5 GHz band, with big contiguous chunks of it needed to deliver the best capacity outcomes. In that context we also discussed the pros and cons of spectrum being licensed and concluded spectrum availability is one of the biggest factors affecting the speed of 5G rollout. Next I met Gustav Brismark, Chief Intellectual Property Officer, who was carrying a patent that took up an entire large, hardback book, which covers 5G NR. This seems to be a pretty big deal for Ericsson, which takes pride in being the biggest contributor to mobile standards. 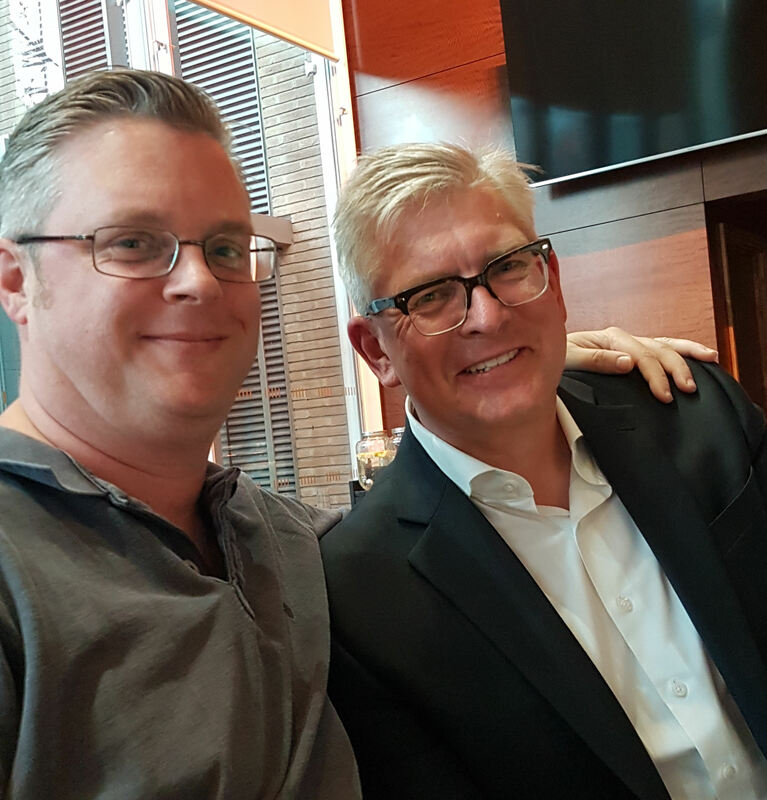 We chatted about the standardization process and the need for FRAND licensing, to ensure major contributors to standards are not able to hold the rest of the industry to ransom. 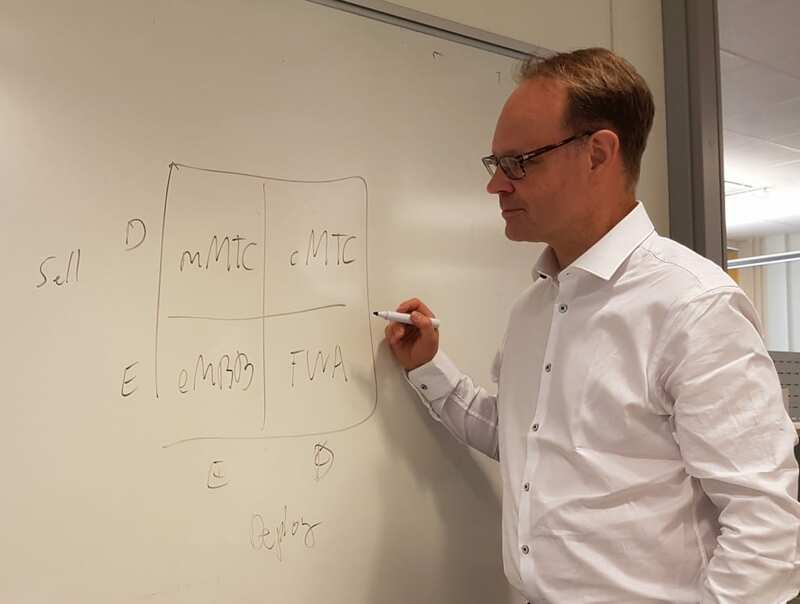 My final meeting was with Thomas Norén, head of 5G Commercialization, who took me through some of the business cases for 5G. The grid in the photo below organises the four key features of 5G according to how easy they are to both sell and deploy, with enhanced mobile broadband easy on both counts and critical machine type communications conversely tricky. Thomas was keen to emphasise some of the technological advantages he reckons Ericsson has over its competitors, with the ability to easily upgrade its latest kit to 5G uppermost among the competitive trump cards in its deck. I asked if that’s why Nokia CEO Rajeev Suri decided to brief against exactly such a feature and let’s just say Thomas made his disagreement abundantly clear. I didn’t get to meet Börje Ekholm on that trip as he was off flying around the world doing all kinds of important CEO stuff like signing deals and hatching plans, presumably. More recently, however, a few telecoms hacks got to share a beer with him in London, which was fun. I couldn’t resist dangling the Nokia FUD carrot to him too and he diplomatically side-stepped the issue by noting they must be doing something right if their competitors publicly brief against them. You can hear more about those drinks on this podcast and here’s a photo of me hanging out with the main man. Public relations has become a lot more streamlined over the past decade or two and visits like these are increasingly rare. The vast majority of what I write is derived from some single written source such as a press release, so it’s good to put a human face on the companies we cover from time to time and maybe even introduce a spot of nuance to my coverage. Ericsson is a big company, humbled by its reversals of recent years. Everyone I met reflected that humility and I get the impression Swedes are generally quite understated anyway. But at the same time there was a lot of pride and ambition on show and I think they’re looking forward to a time when they can be a bit less humble. There are signs of recovery now and it would be cool to go back to Stockholm and check in with them in a year or two, if only to visit another island in the Archipelago and have a bit more aquavit.